Volunteers with a special collection permit dispose of derelict crab pots after a coastal cleanup near Manteo. Pots and other fishing gear are typically off-limits to such efforts. Photo by Bill Birkemeier. On a blustery winter day, 27 volunteers gathered at the north end of Roanoke Island and gazed out on an angry Albemarle Sound. They had come, dressed in waders and bundled against the cold weather, to remove marine debris from Fort Raleigh National Site’s shoreline. But, this was no ordinary coastal cleanup. Armed with shovels and beach carts, their target was the large number of deteriorating crab pots that weighed down marsh grass or lay, half buried, in the sand. “You have to be prepared to get into the brambles and get into the weeds and wade out in the water to go and bring these in, but it is a lot safer to have them off the beaches,” says Peggy Birkemeier who participated in the effort with her husband, Bill. The pots are a type of marine debris referred to as derelict fishing gear. Lines, pots, nets and other recreational or commercial harvest equipment that have been lost or willfully abandoned or discarded are considered derelict. 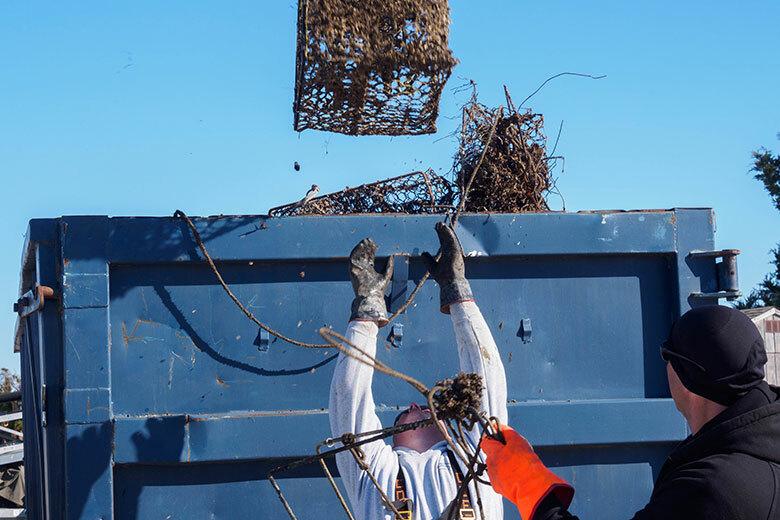 The volunteers were participants in the first effort by North Carolina Sea Grant to identify new programs and policies that will allow for more extensive and cost-efficient removal of derelict fishing gear from coastlines and waterways. In the days following the shoreline cleanup, area fishermen used their knowledge of the region, and sonar-imaging techniques, to search for pots as part of a N.C. Coastal Federation research project. The effort was funded by Sea Grant as well as by the National Oceanic and Atmospheric Administration, or NOAA. 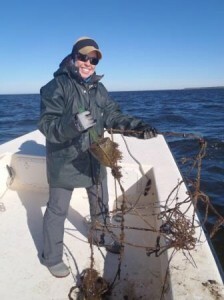 “The on-water cleanup of derelict crab pots during winter 2014 marked the first time persons other than N.C. Marine Patrol officers were allowed to remove the in-water debris, with commercial crabbers working alongside law enforcement,” says Sara Mirabilio, a Sea Grant fisheries specialist. Until recently, the law has been interpreted to mean that only the person who set it, and the Marine Patrol, could remove fishing gear from waterways. During the 2014 no-potting period, the Marine Patrol agreed to issue a scientific collection and educational permit to the federation that allowed assistance from a select group of commercial fishermen within a narrowly defined geographic area and time frame. 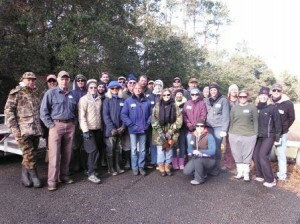 Volunteers met to clean up the north end of Roanoke Island during the no-potting period in January. Photo by Bill Birkemeier. The effect of derelict fishing gear, one subset of marine debris, is variable and hard to quantify. Lost or abandoned fishing gear can “ghost fish” or continue to trap organisms. A recent study of seven NOAA-funded projects published in the journal, Marine Pollution Bulletin, describes ghost fishing as “chronic stressors in many fisheries” and calls for more research. Derelict gear also is known to degrade habitat, impair navigation, pose safety hazards and be unsightly. Despite the lack of hard data, it is commonly understood that derelict fishing gear is having an impact on fisheries. To address the issue, in 2003, the state established a no-potting period. During this time, which currently runs from Jan. 15 to Feb. 7 every year, North Carolina crabbers are legally required to remove all of their pots from the water. Marine Patrol removes any pots remaining in the water during the no-potting period. It is a big job. In 2004, after Hurricane Isabel, Marine Patrol officers removed 7,708 pots from their northern district, which includes the northern coast of the state from the Virginia state line to Ocracoke Island, and 8,343 pots coastwide. In 2013, officers removed 451 pots from the northern district and 1,441 total. In general, the number of derelict crab pots collected every year has gone down. One reason for this may be that as the cost of pots has risen — a typical crab pot now costs between $40 and $50 — fishermen search more in earnest to find lost gear and retrieve set pots during the no-potting period. Scrap metal prices also have increased, which translates into fewer pots being “disposed of” in the water. The work to recover derelict crab pots is labor intensive and time consuming for the Marine Patrol and diverts them from other law-enforcement duties. But volunteers are happy to do the job, given the opportunity. Despite a nor’easter bearing down on the area, in under two hours, project volunteers, from high schoolers to retirees, had removed 620 pounds of solid waste and 380 pounds of derelict fishing gear. Most of the haul was crab pots, from about a half-mile of shoreline. In two days, nine boat crews — 17 commercial fishermen in total — alongside 14 N.C. Marine Patrol officers, removed 364 pots from approximately 200,000 acres of internal coastal waters including upper Pamlico Sound, Croatan Sound, Roanoke Sound, lower Currituck Sound, Albemarle Sound, Alligator River and Kitty Hawk Bay. Four of the nine crews were equipped with side-scan sonar units to search for rarely collected submerged, hidden pots, particularly in the vicinities of bridges where overhangs and obstructions make for increased gear loss. Drew Whitfield, a local shrimper who helped with the effort, frequently catches lost or abandoned crab pots. “Anything to get them off the bottom is better for me,” he says. The data the fishermen collected indicate that “hotspots” exist where pots congregate. Bridge abutments, changes in underwater terrain and other features can collect pots as they move around in the shallow water due to tides, wind, storms and currents. By marking these spots, future efforts to find and remove the gear will be easier. Derelict crab pots were found and retrieved in a wide range of conditions. Photo courtesy N.C. Coastal Federation. Pots that were removed were in all states of deterioration, from scraps of mesh, to complete pots with little fouling. Those that could be salvaged were rendered unable to capture fish and crabs, and set aside for artificial reef construction. 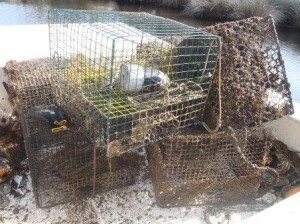 Researchers and fishermen have long known that crab pots make good substrate for oysters. Approximately 90 of the salvaged pots from 2014 will be dipped in mortar and used as artificial substrate for oyster larval settlement and growth in a future phase of the project. Look for an upcoming article in Coastwatch about the work of Joel Fodrie at the University of North Carolina at Chapel Hill’s Institute of Marine Sciences and others who use crab pots to assist with oyster restoration. A second phase of collection will take place during the no-potting period in January 2015. To learn more about the effort, visit www.nccoast.org. In initial pursuits to develop avenues for improved removal of derelict fishing gear, Sea Grant extension specialists Sara Mirabilio, Gloria Putnam and Lisa Schiavinato worked collaboratively with stakeholders to create a shared understanding of the derelict fishing gear management issues in North Carolina. The group sought to identify possible changes in regulations, programs or policies. In spring 2013, the team met in Beaufort County with stakeholders — including representatives from the commercial fishing industry, the federation, Marine Patrol, N.C. Division of Marine Fisheries, Albemarle-Pamlico National Estuary Partnership, Coastal Plain Conservation Group, and NOAA Beaufort Lab — to gather information about derelict fishing gear in North Carolina. Approximately 90 derelict pots were set aside to construct oyster reefs. Photo courtesy N.C. Coastal Federation. At the N.C. Marine Debris Symposium in Sneads Ferry in September, Putnam presented the team’s findings. She described recommendations developed to improve derelict fishing gear management in the state and increase citizen participation. The first involves reducing gear loss by promoting collaborative research into pot design. “At our stakeholder meeting, a crabber noted that he had been playing around with a half buoy instead of a full buoy on his crab pots to see if they would prevent extreme movement during storms,” Putnam says. The team also calls for a clear definition of derelict fishing gear that more easily enables citizens to discern whether gear is derelict. They also suggest the state re-examine how fishing gear is marked to identify ownership. Putnam presented novel ways that derelict fishing gear can be tracked and located. She mentioned side-scan sonar, as well as digital tracking and mobile reporting applications, such as the Marine Debris Tracker developed by the University of Georgia and available at www.marinedebris.engr.uga.edu. The team also recommends a new outreach campaign to encourage more commercial fishermen to report their own lost gear, and help users of coastal waters to understand what constitutes derelict fishing gear and report sightings. “If we are able to address some of these issues and get more citizens involved, we will promote marine stewardship, receive economic returns — in part by reducing Marine Patrol’s need to address the issue — and improve habitats,” Putnam says. To learn more about derelict fishing gear, visit the North Carolina Sea Grant website at www.ncseagrant.org. Or contact Sara Mirabilio at saram@csi.northcarolina.edu. Crab pots are only one form of derelict fishing gear. Other types include nets, fishing tackle and line. After witnessing the death of a dolphin calf that had become entangled in monofilament fishing line, Keith Rittmaster of the N.C. Maritime Museum and Victoria Thayer of the N.C. Division of Marine Fisheries started the N.C. Monofilament Recovery and Recycling Program. Based on a similar program in Florida, Rittmaster and Thayer, with colleagues and volunteers, build, install and maintain approximately 50 four-foot tall, 6-inch diameter PVC receptacles. The containers can be found at bait-and-tackle shops, boat ramps, marinas, fishing piers, and other fishing and boating locations. Since 2007, the program has collected approximately 1,100 miles of monofilament fishing line. After removing hooks, leaders and other tackle, they send it to a fishing line manufacturer in Iowa that turns it into other plastic products, such as tackle boxes. Funds for the initiative come from the N.C. Maritime Museum “Protect Wild Dolphins” special license plate and from donations. To learn more, go to www.capelookoutstudies.org and look under Programs. This article was published in the Holiday 2014 issue of Coastwatch.